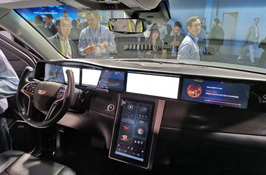 At CES 2019, Qualcomm tested its new C-V2X technology, which stands for a car connected to everything. Equipped with means of communication through cellular networks 5G cars can "communicate" with each other, with the urban infrastructure, with other traffic participants, thus bringing users closer to self-driving cars. Also Qualcomm showed its vision of a smart car's salon. Such salon is available in three versions: Performance, Premiere and Paramount for premium cars, middle and mass segment. All systems are based on the Snapdragon 820a platform, the key in it is the multi-core AI module, Kryo core and wireless communications, including Wi-Fi 6 standard.